Republic of Polania (white): The Polanian mech is inspired by the streamlined look of airplanes and submarines. It has the ability to submerge into a lake and–by using the underground river system–surface on any other lake. It’s also people-friendly, as the Polanian player can use the mech to gently push opponent’s workers off of territories without losing popularity. Saxony Empire (black): The Saxon mech is built for tunneling through narrow passages in the mountains of Saxony and beyond. You don’t want to face a Saxon mech in combat in the dark depths of a tunnel. Crimean Khanate (yellow): The Crimean mech is pieced together from the scrapyard, as the Crimeans rejected the idea mech technology until it was too late. It specializes in traveling long distances and can allow a player to scout and steal an opponent’s combat card before combat begins. Nordic Kingdoms (blue): The Nordic mech is inspired by Viking longships. It has the ability to both walk on land and sail on lakes, and it comes with long-range artillery to damage the opponent before combat even begins. Rusviet Union (red): The Rusviet mech, with its war scythes, is a formidable figure on the battlefield. It has access to a secret network leading from villages to the Factory. It also becomes more powerful in combat when accompanied by workers. Clan Albion (green): The Albion mech, inspired by Scottish bagpipes, has a rotating array of weapons that can be used for attack or defense. It also has the ability to use tunnel territories as a guide to cross rivers, and they can quickly cross great expanses to rally to help endangered workers. Togawa Shogunate (purple): The Togawa mechs are built to sustain even the harshest elements, particularly water. They’re built for solo combat and adventures, not pack hunting. And they include several devious contraptions that allow them to rearm traps laid by Akiko and Jiro. These mechs and illustrations were created by Jakub Rozalski. Carsten Biernat & Jozsef Szollosi of Unique Voodoo Studio are the 3D modelers for Scythe’s miniatures. Will there be an option for Diecast metal Mechs or Wooden Mechs after the release? It would be great to have a more solid feel and look (not that actual minis/figures don’t give that impression). I will also be looking forward to paint these, leaving the base faction colour of course. Travis: That’s a neat idea! It’s not something we’ve considered, and I’m hesitant to make more special editions of Scythe after already selling special editions of it on Kickstarter. But if there’s demand for it in the future, we could consider it. Instead of an additional special addition original game you could offer the metal mechs as a limited edition expansion package in one of the future expansions you possibly release. This way people can still get the items they want in a limited edition capacity without those on kickstarter getting upset. The pieces themselves could also be sold separately for anyone who wants to just get better looking mech pieces. Will you add a French faction ? After WWI, french had one the best army of the world, with a large ammount of Tank used even in Japan. Maybe! I’d love to someday add factions inspired by a number of different countries, including France. The only issue with more factions (which I would LOVE to see) would be a different board. However, if you have, say, the French, you could give them a faction home base that is made out of the cardboard the coins are made out of to cover up any unused faction being replaced by the French. This would work well (at least I think). One more thing. Can you please give the airships some variety? Because I read on a post that the models will be the same. I feel this would make them rather bland. So I’m just saying that you could maybe change the hull a little bit per faction. I feel it would help in the long run. 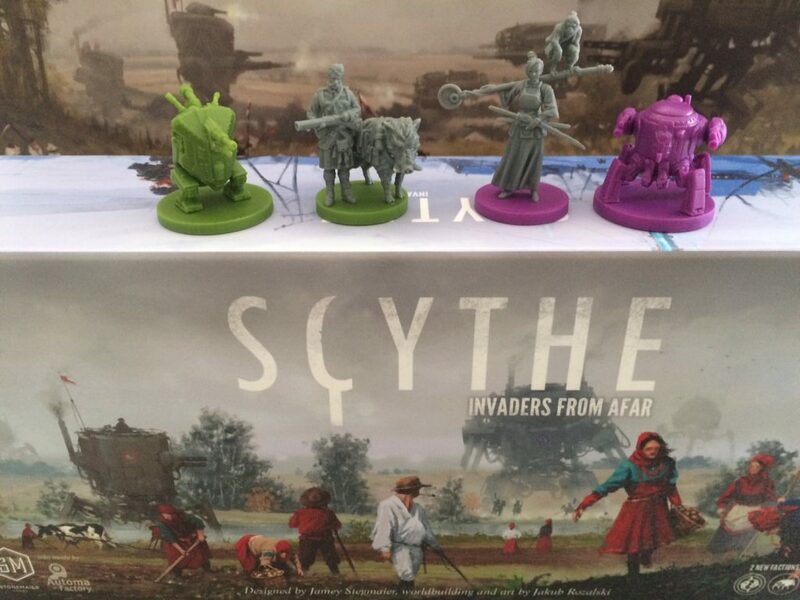 Anyway, scythe is my favorite board game so far, and would love to see waht great ideas can be added to it. With today’s announcement that pre-orders for Scythe: The Wind Gambit are now available through retailers, I thought I’d share a behind-the-scenes look into the process of designing and refining the airship miniature. That’s right–airships in The Wind Gambit physically carry workers and resources. That might give you a sense of scale when looking at the image below. The airships are 104mm long, bigger than 3 mechs placed side to side. They’re elevated 40mm above the table on a clear plastic stand (the position and height of which we had to carefully calibrate to ensure good balance). With this final model in hand, Panda will make the mould next week and start making the 41,000 sets of miniatures for the first print run of The Wind Gambit! Good question. There has been enough interest in it that normally I would proceed to make them. The challenge in this case is that there’s a significant up-front investment, as we can’t use the same moulds that we use for the plastic mechs. Also, even though people have indicated on the form that they would pay upwards of $80 for those mechs, clicking a button on a poll is quite different than actually authorizing such a big purchase. I’ll continue to keep an eye on the poll numbers to see if it’s something we could try. Sounds like the perfect fit for Kickstarter! Hahaha! Just kidding. Look who I’m talking to. :) Thanks Jamey! You rock! This has probably been beat to death, but I can’t find it on BBG, so…I’m confused by the Speed ability. Is that +1 hex each time you take the Movement action (meaning that when you take the movement action, one of your mechs/character could move one additional space) or for each movement icon you get an additional hex (meaning that if you have 2 movement icons, two of your mechs/character could move one additional hex each)? Thanks! Regarding the metal mechs; would it be possible to color the bases their faction color leaving the actual mechs uncolored? Thanks Nick! We tried that, and it didn’t look as good as they do without any color. as an alternative to the metal mechs, I would much rather have painted mechs of a reasonable quality. What are the numbers on that? Any consideration for larger scale mechs? I briefly considered it, but they I looked into what it would entail (dozens of new moulds, a significantly higher cost per unit, and a struggle to fit them on the board), and I decided against it. We are making metal mechs, though! when painting them, do they need to be primed or can paint be applied straight onto the plastic? You know, I’m not sure–I don’t know much about painting. But if you ask in the Scythe Facebook group, they know quite a bit about painting.